On paper this looks like a great travel zoom camera and it feels very nice in the hand. The viewfinder is a real bonus when shooting in bright light. The HX90V is a solidly performing all round travel compact camera that offers a lot but doesn't deliver in every single area. There have been some good improvements to image quality, but it's still not fantastic for low light shooting. If you think you're going to want raw format shooting, though, the Panasonic TZ70 is your best bet. Smartphones are getting so capable at taking pictures that you need a good reason to take an actual camera with you when you travel these days – and one compelling reason is that you'll generally get a more powerful zoom lens. But why stick at the paltry 5x zoom range you get with a typical point-and-shoot camera when you can get a whopping 30x zoom instead? That's the thinking behind 'travel cameras', a sub-genre of the compact camera market that packs a big zoom range into a small body. They cost more than regular compacts, but when you're on the trip of a lifetime you won't want to miss a moment of it. Panasonic has long been king of this particular sector, and it's the Panasonic TZ70 which sets the benchmark for performance, usability and results – this is the camera Sony's new HX90V needs to beat. The Sony HX90V packs a 30x zoom into a compact camera sized body. 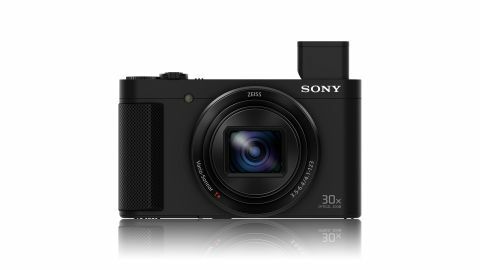 The HX90V replaces the Sony HX60, and the most significant difference is the introduction of an electronic viewfinder (EVF), which makes the HX90V almost a miniature version of the Sony's RX100 III/IV high-end compact camera – it collapses into the body of the camera to maintain the small size and clean lines. The 30x zoom range is the same as the HX60's, giving you an equivalent of a 24-720mm zoom range in 35mm terms. However, for the newer model, it's a superior Zeiss optic, compared with the HX60's Sony G lens. Sony has also managed to reduce the physical size of the lens by around 30%. It's also the same 1/2.3-inch type Exmor R CMOS sensor with 18.2 million effective pixels. As before, the sensor is coupled with a Bionz X processor (Sony's best), which uses both area-specific noise reduction and diffraction reducing technology to help produce sharper, more detailed images. This processor also enables the HX90 to record full HD 8-bit 4:2:0 video footage at up to 50Mbps in AVCHS, MP4 or the new XAVC S format at 50p/60p. Like the HX60, the HX90 has Sony's SteadyShot system, but the stabilization has been extended from 3-axis to 5-axis, which should mean blur is avoided in a wider range of situations – and this stabilization operates for stills and video recording. Other differences from the HX60 include the addition of Expand Flexible Spot AF to help with focus tracking (the system uses a larger spot to track the subject if it is momentarily lost), the ability to adjust the speed to lens zooming, and the ability to bracket exposures when using self-timer mode. Sony produces two versions of the HX90: the CyberShot HX90 and the CyberShot HX90V. The only difference between the two models is that the V-version has GPS technology inside whereas the HX90 doesn't. Both versions have Wi-Fi and NFC connectivity built in, and are compatible with some of the apps available via Sony's PlayMemories scheme, where you can buy app add-ons to extend your camera's capabilities. The HX90V is impressively slim, considering it houses not only a 30x optical zoom, but also an (albeit small) electronic viewfinder. You should be able to slip this easily into all but the tightest of pockets, and it's nice and lightweight too. On the front of the camera is a ridged area where your forefinger rests, making it feel nice and secure in the hand. There's also a small thumb rest on the back of the camera. The electronic viewfinder is deployed with a two-step process. First you flick a switch down to pop the viewfinder up, then you pull part of it back – it would be nice if this was an automated process. The viewfinder is useful in bright sunshine when it's difficult to use the main screen, but it's quite small and I didn't find that I wanted to use all that often; there's also no eyecup, so it can be a little distracting to use. Popping up the viewfinder switches on the camera, while pushing it back inside its housing switches it off. If you're not using the viewfinder there's also an on/off button on the top of the camera. The controls on the back of the camera are all clustered to the right to help one-handed operation. The rear screen tilts, but it's not fully articulated. All of the HX90's buttons are on the right hand side of the camera, which makes it easy to use one-handed. The buttons are a little on the small side, so those with larger fingers may find them fiddly. The mode dial on top of the camera is within easy reach of your thumb, so you can quickly scroll to a different exposure mode – it's also not too loose, so it's unlikely that you're going to change modes accidentally. Pressing the Fn (function) button activates the quick menu. There are various options here by default, but you can customise it to your own shooting preference if you prefer. To change the autofocus point you select Flexible Spot mode, press the button in the middle of the scrolling dial on the back of the camera and then use the directional keys to choose the point you need. It's not a difficult process, but it can be a little laborious if you need to get from one side of the screen to the other – a touch-sensitive screen would make this operation much quicker. The HX90's screen can flip forward to face the front, making it useful for shooting from some awkward angles, but it can't be angled downwards. If you face it all the way forwards, self-timer (selfie) mode will automatically activate, although if you have the viewfinder raised you'll need to push this back in to get a completely unencumbered view of the screen.